It was published by the Philadelphia firm Lea & Blanchard and released in two volumes. The publisher was willing to print the anthology based on the recent success of Poe's story "The Fall of the House of Usher." Even so, Lea & Blanchard would not pay Poe any royalties; he was given 20 free copies. It was dedicated to William Drayton, a former member of Congress turned judge who may have subsidized the book's publication. 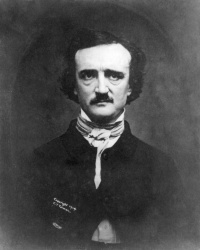 In his preface, Poe wrote the now-famous quote defending himself from the criticism that his tales were part of "Germanism." He wrote, "If in many of my productions terror has been the thesis, I maintain that terror is not of Germany but of the soul." There has been some debate over the meaning of Poe's terms "Grotesque" and "Arabesque." Both terms refer to a type of art used to decorate walls. These arts styles are known for their complex nature. It has been proposed that the "grotesque" stories are those where the character becomes a caricature or satire, as in "The Man That Was Used Up." The "arabesque" stories focus on a single aspect of a character, often psychological, such as "The Fall of the House of Usher." "The Man That Was Used Up — A Tale of the Late Bugaboo and Kickapoo Campaign"
"MS. Found in a Bottle"
"The Devil in the Belfry"
"King Pest — A Tale Containing an Allegory"
Unless indicated otherwise, the text in this article is either based on Wikipedia article "Tales of the Grotesque and Arabesque" or another language Wikipedia page thereof used under the terms of the GNU Free Documentation License; or on original research by Jahsonic and friends. See Art and Popular Culture's copyright notice. This page was last modified 21:58, 31 January 2014.